“Real power is when you intrinsically make efforts to educate, feed and enable the less privileged to lead a better life”. 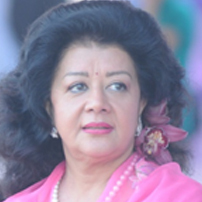 Princess hails from the Legendary Rana family of Nepal who ruled Nepal for 104 years. Her Great Grandfather was HH Maharaja Chander Shumshere Jung Bahadur Rana who was considered the most enlightened and benevolent Prime Minster of his time. The Princess did her education from India and Nepal. She married into the Royal family of Baroda to Prince Sangramsinh Gaekwad, the son of HH Maharaja Pratapsinhrao Gaekwad. •	Princess is the Chairperson & Executive Director of several companies both in India & Nepal. •	She is interested in Women’s Welfare and Sports and had been the President of Women’s Cricket in Baroda. •	The Gaekwad Art Foundation, a Charitable Trust was formed by Princess Asharaje Gaekwad. The Foundation strives to promote art in all forms and aims at being a voice for those who communicate through their amazing works of art. The Foundation has also helped young artists to showcase their works in the best art galleries whenever required. •	She has been actively involved in working for the Non-Resident Nepalese living in India, for the past 14 to 15 years and is the Chairperson of several foundations connected with the people of Nepal. •	She set up ‘Hope for Nepal Foundation’ in Nepal, which is a Charitable Organization for the welfare of the Nepalese people. After the devastating earthquake on 25th April, 2015, the ‘Hope for Nepal Foundation’ has done relief work for all the 14 most devastated districts, as well as, orphanages, old age homes, handicapped people, schools, hospitals etc. And, now as part of the initiative of the Foundation, ‘Hope for Nepal’ the Princess and her Trustees have started planning for the rehabilitation work for the displaced people and will start work as soon as the Foundation gets permission from the government. •	She has also set up the Princess Asharaje Gaekwad Educational Trust to ensure that every child in Nepal is assured of getting education. •	Princess is well travelled and has attended many Art Exhibitions and has inaugurated the Maharaja Gala at the Virginia Museum of Fine Arts, in San Francisco where she graced the occasion as Chief Royal Dignitary. •	She has visited several countries to participate in Conferences including the ICC International Conference in Bangladesh and Asia-Pacific Business Forum in Colombo, Sri Lanka, by the UNESCAP. •	She attended the 2nd WCH Humanitarian Summit in New York. •	At the 7th World Confluence of Humanity, Power & Spirituality she spoke on the topic of “Leadership & Spirituality at Work”. •	She also attended the World Cultural Festival 2016 and Global Leadership Forum. •	She was conferred the award of “Asia’s Royal Woman of the Year”, at the 3rd Global Officials of Dignity (G.O.D). Awards held on August 7, 2015 at the United Nations Headquarters, New York. •	She attended the 5th Global Baku Forum in Azerbaijan, Baku. •	She started the Rastrabadi Bikashsheel Abhiyan to interact with the people of Nepal to better understand and solve their problems. Princess Asharaje is also on the advisory board of IdeaHive Media Pvt Ltd; a young ‘Cause Driven Campaign Management’ agency based in India. The agency works towards creating campaigns on various social issues plaguing the nation leading to a positive impact on society through advocacy, behavioural changes in society and also bring support at grassroots. She has been working very closely with the team, mentoring them on various projects. She launched a national initiative for the cause of water, called ‘Paani Ka Teeka’ movement. She is also involved with the team on their next set of projects currently at development stage; including an initiative for the girl child, a fund raising project for Nepal, a project for the Indian Railways on spreading awareness on safety measures and bringing down the accident ratio. Some of the other plans at IdeaHive, also include creating fund raising for various social causes and NGOs. Attempts at IdeaHive are aimed at bringing transformation at grassroots across the nation backed by a strong ideology to bring change in society.